To produce the kind of digital marketing content necessary to grow your blog, you’re likely to need a team of writers. An outside writer is someone not associated with your brand who creates content assets for your blog. Those content assets are typically written articles, but the content can also take the form of audio, video, and images for your blog. Acquiring quality outside content creators gives your blog a broad range of perspectives and can help give authority and reach to your blog. This is especially true if the content creator is an influencer, that is, someone who has an above-average impact in his or her niche. Influencers often have a following of their own and are connected to key players in media outlets, consumer groups, or industry associations. For instance, if your blog is on the vegan lifestyle, you can search for “vegan blogs” and find links to top vegan blogs and authors who have contributed to those blogs. Don’t just search the first page of the search engine results page. Search deep into the results pages, many pages in — this is where you might stumble upon a good writer who may not be receiving very much traffic. These bloggers are very receptive to contributing content to other blogs to receive more exposure for their own blog. Another way you can find content creators is to visit blogs that are writing about topics that are the same as, or related to, your own and contact their guest bloggers. Often, these are freelance writers and bloggers who would be willing to write for your blog for money and exposure to your audience. Next, you may be able to find content creators from your best commenters. These are people who leave the most in-depth and thoughtful comments on your articles. Not only are these commenters engaged with you, they know your style, and they may be writers and speakers looking for exposure. Acceptance of bylined articles: Most writers want to know that you will include a byline with a link to their website; let them know you do. Statement that you pay for articles: If you pay for articles, you increase the response rate by letting writers know on the Write for Us page. You don’t have to include how much you pay. Content categories: Outline the topics you want guest writers to write about. Examples: Link to sample articles that model the posts you want from guest writers. A form: Include a form that the interested writer can fill out to contact you. Ask for the writer’s name and email, at a minimum. To filter out low-quality submissions, ask interested writers to submit writing samples. MarketingProfs does an excellent job of creating a very detailed Write for Us page to help find quality content creators. 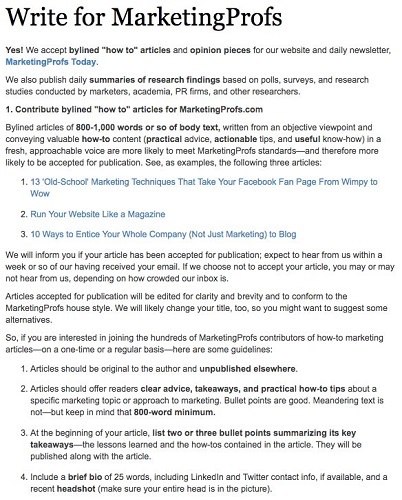 An excerpt from MarketingProfs’ “Write for Us” page. After you find content contributors who interest you, it’s time to reach out to them. Understand that outside content creators will produce content for your blog for one of two reasons: money or exposure (or both). For writers doing it for the first reason, the process is simple: You cut them a check, and they create a piece of content for you. As a rule, the more specialized the knowledge your writer needs, the more the content will cost you. It’s a supply and demand thing. If you’re unsure how much the going rate for a writer is, you can visit sites such as Craigslist and ProBlogger Job Board to browse through the open jobs. Aside from money, what you can offer writers is exposure to your audience. If your blog has impressive amounts of traffic, social shares, or comments from readers, share that information with the outside writers you are courting. You will find that the more exposure you have to offer writers, the less you will have to pay for their content. In fact, after your blog reaches a critical mass, you won’t need to pay a dime for content — writers will come to you for the exposure. Keep in mind that the reach the writer brings to the table will affect how much you have to pay him or her. The more influence and followers your guest writer has, the more money and exposure that author will require from you. The best way to ensure success from an outside writer is to be prepared with guidelines for your blog. These guidelines, like those on the Write for Us page, communicate what types of content perform best on your blog, what audience you gear your articles toward, and other standards for an outside writer’s work to meet. For instance, if your blog doesn’t accept certain kinds of images (stock or personal photography, for example) indicate those restrictions in your guidelines. If you require your images to be a certain size, with a certain resolution and with a specific border, list those requirements. Your guidelines are the information your writers need to shape the content you want them to provide you, and having guidelines will save you a mess of editing, formatting, and image polishing when you receive their final work. fter connecting with outside writers who have indicated interest in writing for you, send them your guidelines so that they know what to expect. You can send the guidelines in a separate document or paste them directly into your correspondence. Next, lead with examples by showing writers articles on your own blog that you want their article to model. Also, provide links to content that has done well in the past to help the writers get a sense of what direction to take the article. The working title: The title of a blog post, also called a headline, is a promise to the reader. The working title isn’t necessarily the headline that will be published on your blog, but it is a guiding statement for the writer as he produces the post. The outline: You want to know how the post will lay out, details for each section, and what images the writer expects to use. The more detail you receive from the writer upfront, the greater the chance for the article’s success. When writers send back the working title and outline, approve or make suggestions and ask questions until you’re satisfied that their efforts will generate a post that is publishable on your blog. Last, discuss timeframes and deadlines. Depending on the type of post, expect the writer to take between one and three weeks to develop the first draft. If you’ve never worked with someone before, ask her to write the first 25 percent and send it to you or your editor for review. This preview will allow you to make adjustments and work with the writer before she completes the post. Be sure to respect the writers’ time as they’ve respected yours and set expectations on turnaround time. How long will they have to wait until you send back edits or questions? How long before they know their post is approved? When will you communicate their publish date to them? With guidelines, timing, and expectations set, you ensure that your content creating process can go off without a hitch.